What is the difference between these two words: "þisse," and "þisre," which, according to the aforementioned, both function, in the Old English tongue as "this"? Both are listed as both genitive and dative case feminine singular. The same goes for "þissa," and "þisra", which are both listed as being "these" in the genitive plural case. Are these variations used in specific cases? Or is one of the words classical, and the other newer, one developing early, and one after the Norman conquest? Or are they dialectal differences? — e.g. 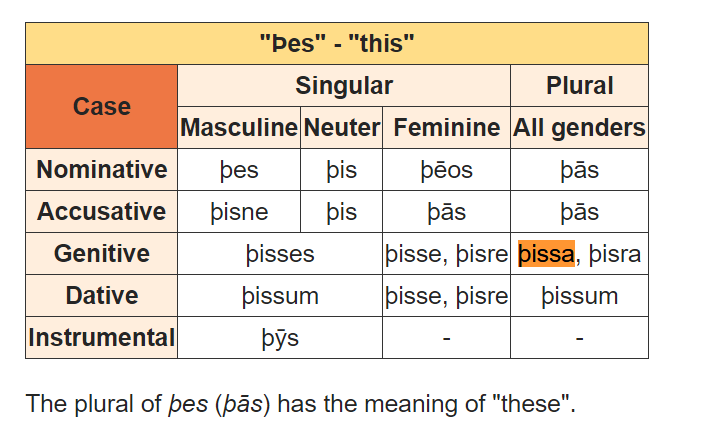 the Ænglisc first person singular accusative pronoun was "mec", but toward the end of the language’s life, before Middle English came about, "mec" was replaced with the dative and instrumental first person singular pronoun "mé." — e.g. in the West Saxon dialect of Old English, "hand," was the word for "hand," as in the human hand, but in another common dialect of Ænglisc, the word was spelled and pronounced as "hond." Old English is an inflected language, so all words must agree in some form, therefore one does not simply say "mín hand": the genitive singular pronoun does not agree with the noun it owns, "hand", which is feminine. One must say "míne hand", adding "-e", the feminine singular possessive ending, to the stem "mín-." That being said, suppose a man wanted to show off his hand, and say: "Lo! this is my hand!" Would he say "Hwæt! þēos míne hand!" ("þēos" being the feminine nominative singular form of the article "this"), or would he say: "Hwæt! þisse/þisre míne hand"? Caligula appears to be closer to the original with the language more archaic than that of Otho, which shortened and modernized Laзamon's narrative. Here should be mentioned also an increasing use of þisse in genitive, dative, and post-prepositional contexts, which in Otho almost completely replaces þisses, þissen, and þissere. * This apparently reduced form is only one step removed from indeclinable þis: it would lose the final vowel and merge into the latter in due course of time. Old English has the genitive or dative singular feminine þisse as well as þissere, “developed by parasiting from þisre” (Campbell, §711). Some instances of þisse therefore could be a reflex of the historical feminine form, though it should rather be taken as a reduced form of þissere, which is almost exclusively found as the genitive or dative singular feminine in Caligula, in line with the development of þisses and þissen. þes is min leofa sunu ðe me wel licað. This is my dear son who greatly pleases me. You should say "Hwæt! þēos is míne hand!" I think it's a matter of preference. Etymologically and linguistically speaking, yes, they are the same word. Though I can't pretend to know a lot about Old English, I researched it a bit, and it seems like the same kind of difference as the one between "you all" and "y'all" in colloquial English. In his book Essays on Nominal Determination: From Morphology to Discourse Management, Henrik Müller listed the two words as having the same purpose and usage, and en.wiktionary.org agrees. A University of Michigan Middle English Dictionary entry and your site also seem to concur. Obviously, we can't ever know for sure, since no one speaks Old English anymore, but it seems to me that the two can be used interchangeably. Again, I know much less on this than you seem to, but it's a matter of logic, really. Not the answer you're looking for? Browse other questions tagged grammar pronouns grammatical-case old-english this-that or ask your own question. Do Old English dialects correspond well with modern English ones?